Most of our customers start off with an existing fireplace which they have a vague notion might be able to house a stove. 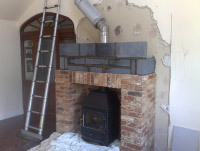 Whether you plan to open up a blocked up chimney, rearrange and revitalise your existing fireplace or create something from absolute scratch, Suffolk Stove Installations can co-ordinate it all. This is what became of a 1970s open fireback. 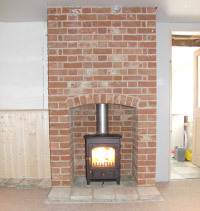 The flue from the stove simply breaks through the rear wall and into the chimney space. 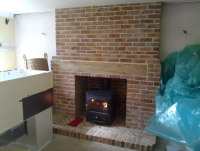 The brickwork fireplace was built in over the face by one of our carefully chosen contractor bricklayers. This fireplace, slate hearth and backpanel with a Limestone surround, was perfectly suited to house an inset stove. The customer didn’t want to have an open recess as the fireplace but wanted the efficiency and controllability of a stove rather than an open fire. Even customers who live in older, character properties need to have building preparation work done sometimes. This couple for example had nothing there at all as the first floor of the stack had been removed. The breast was built back up and married with the upper part of the stack, leaving the structure exactly as it would have been originally. In went the stove and off went the heating! You don’t even need a chimney to be able to have a stove installed in your home. This single storey house had a lovely big lounge but no real focal point. Working in conjunction with their own bricklayer we popped a twinwalled flue system through the loft space and out of the roof. Simple when you know how!